There are many benefits to having a television outside. You can entertain on your patio, backyard or by the pool. You can watch your favorite sport while grilling for your guests. Of if you have a place of business, you can show videos or movies to your customers. The obvious problem with having an outdoor television, however, is that it’s quite vulnerable. As you can imagine, it could easily be damaged by the weather or subjected to theft or vandalism. The solution is to find an outdoor TV enclosure that shields your television when you’re not using it. 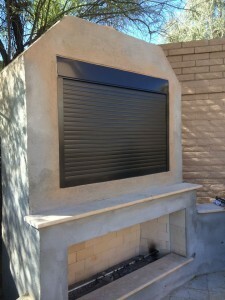 And once you find or build a sturdy, weatherproof enclosure, take it to the next level with easy to use and custom Roll-A-Shield rolling shutters that will provide maximum protection for your outdoor television. Outdoor TV’s are becoming more and more popular. This is probably due to the fact that it enables you to expand the entertainment capacity of your house. You might, for example, have a movie playing for the kids inside, while your watch a sporting event by the pool with the adults. It’s also useful for bars, restaurants and other business with outdoor areas. So when spending the resources to add a TV or two outside, it makes sense that you would want to take a few extra steps to make sure your investment is protected from the elements and threats aforementioned. As you know, rain, snow and dust storms can harm electronic equipment. But an outdoor television is also a tempting item to steal. Even if your TV is in a gated or fenced in area, thieves often jump over and are off with your valuables surprisingly fast. This is even a bigger concern when you are out of town. Finally, there’s always the risk of vandalism. One mischievous kid with a rock could smash your screen and render it useless. As long as you’ve taken the trouble to invest in outside TV, you may as well provide it with top-level security. Such as a weatherproof TV enclosure that protects your television equally from humans, animals and the elements. Rolling shutters have gotten popular to protect homes and storefronts. The reason for this is that they are a convenient and simple way to protect your property. Unlike the old days, when rolling gates had to be manually pulled up and down, today’s advanced units are automated. Roll-A-Shield makes motorized shutters that you can control from up close or at a distance. These types of shutters are the perfect solution to protect an outdoor TV. As televisions come in many shapes and sizes their enclosures will greatly vary too. It’ll have to be large enough to accommodate your TV but some chose to add other electronics in with the television as well. So you’ll need something that’s just right for your particular needs. Roll-A-Shield will create a customized solution for you that will fit your enclosure perfectly. There are choices for styles and thickness, depending on your local climate and the level of security you need. This custom sized fit provides the best protection for your outdoor TV from moisture, weather, vandalism and theft. It also provides an attractive and modern looking finish to your enclosure that can be ordered in a color that will compliment the surrounding decor. With a perfect fit and good seal, these metal shutters and enclosures will extend the lifespan of your outdoor television and keep it in good working order. Even when there’s not extreme weather, dust and grime can accumulate in your TV, which can eventually cause problems and reduce performance. With rolling shutters, whenever your television is not in use it will be completely protected. Roll-A-Shield gives you a variety of customization options for protecting your outdoor television. For example, shutters can be controlled in several ways, including keypads, switches and timers. This lets you create a solution that works for your needs. For example, if you have a business with an outdoor television and you close at 10 PM, you could simply set the timer to cover the unit at closing time. This way, employees wouldn’t have to remember to perform this task every night. Rolling shutters also come in many colors, including white, beige, bronze, metallic and grey. Again, you can choose the look that goes with best with your color scheme. When you order a shutter for your TV enclosure from Roll-A-Shield, you will also get professional installation by a courteous and well-trained team who will also show you exactly how it operates. It’s not like ordering something over the internet or buying something at your local home store that you have to figure out yourself. 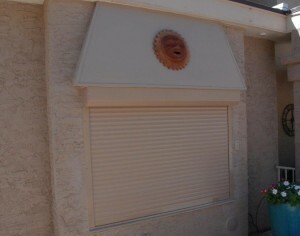 Roll-A-Shield can also service and maintain your shutters. Having professional installation allows you to protect your TV or electronics for your residence or business with confidence, knowing that it was installed correctly by those who do this for a living. If you have an outdoor TV or plan to get one, you should make plans as soon as possible to properly safeguard it. There are simply too many potential problems with leaving any valuable electronic device unprotected. A rolling outdoor TV shield on an enclosure is the most convenient and complete solution. 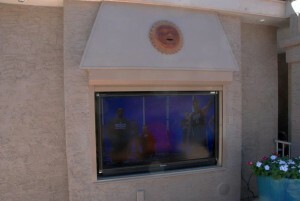 Contact Roll-A-Shield to find out how a customized outdoor TV shield can work for your home or business.